Eek! It's just about been a week since my last post! I'm trying to collect my bearings and get into a routine now that our oldest son has begun Pre-Kindergarten. I've been fortunate to have been able to stay at home with our children but there is one huge disadvantage - routine. He attends in the mornings so now it matters when they wake up, eat, and get dressed. It's definitely a learning curve that I hope to master within the next couple weeks. Until then my posts will probably be a little off balance so please bear with me! I found a card on Pinterest that used both these sets in a similar way and I was completely inspired. I'd been looking at my Fine Feathers set adoringly for quite some time but was stuck in a rut as to what to do with it - these long feathers are perfect pheasant feathers and add an interesting finishing touch! Initially I stamped the pheasant on Whisper White cardstock then colored the image. I was unhappy with the way the colors were blending so I ended up re-stamping the image onto watercolor paper with Staz-On ink then used the marker layering technique to color it in. I'm much happier with the result and the shading of light/dark I was able to achieve. I used the same technique to do the feathers. I ran a line of So Saffron marker down the center then blended Cajun Craze from the center outwards, with a little Soft Suede in areas for shading purposes. I cut each feather out and with paper snips cut small sections towards the center of the feather to make them appear a little more life like. 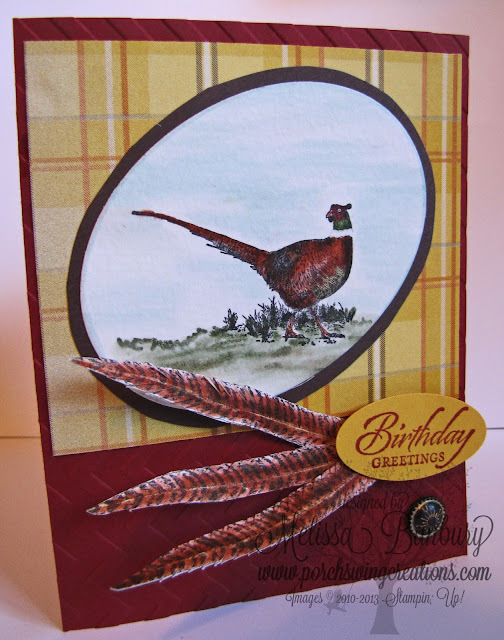 I think this is the beginning of my autumn color inspired cards - I love these color combos! I'm working on a couple of flower image cards using similar colors that I'll share later on this week - have you left the summer "Brights" behind yet for the autumn "Regal" tones? ?